With the recent bad weather here in England, my thoughts have turned to appropriate waterproof footwear, and specifically Wellington boots. I haven’t owned a pair of Wellies since I was a child – I haven’t really had the need to as I don’t tend to go on lengthy walks in the wet. I will either stay inside, travel by car or just put up with getting wet if it rains when I’m already out and about!! But, the weather has been so bad lately, with snow, sleet, hail and rain, that I have been thinking about getting some Wellies to keep my feet dry. I tend to wear size 4 or 5 EEE in sandals and shoes, but in boots I usually size up to a 6, so this was what I went for in my Wellies. The 6 fitted me pretty well in the foot, although I did find them roomy and I wondered if I might have got away with a 5, had they been available (5 was sold out). These Wellies are wide fit so they worked well on my broad tootsies, meaning that I had plenty of room and there was no risk of the boots pinching or rubbing. The Union Jack pattern was rather more bold than I was expecting, but I think it works pretty well with my much-loved raincoat from Principles by Ben De Lisi at Debenhams. I went for this pattern rather than floral as I wanted something a bit different. With hindsight, I think a plain boot might have been best but these will do me well nonetheless. However, I did have quite a big issue with these boots: my large calves. 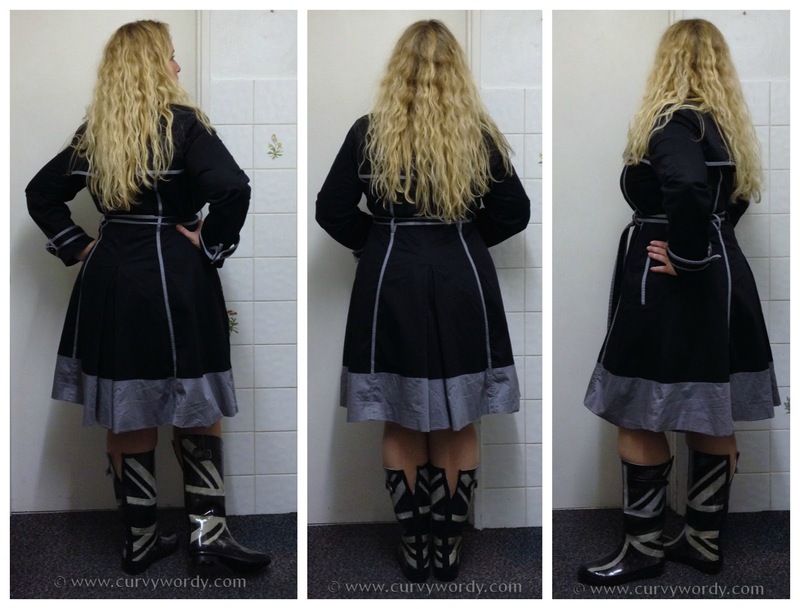 My chunky legs measure around 16-17″ so it’s not easy for me to find regular boots that work, never mind Wellies. I had high hopes for these ones as they were described as wide fit so I was hoping that would apply to the calves as well as to the feet. I took my kitchen scissors and CUT the boots down the back. At last they fitted! You can clearly see from the picture above what I did and that there is a slit of around 6 inches or so. I know the slits are very obvious from my pictures here but when wearing these boots I would have my trusty black Maidenform leggings on so they would be far less noticeable. I appreciate that hacking down the back of brand new Wellies is not ideal but I was determined to get these to fit, by hook or by crook (or by scissors)! I have toyed with the idea of chopping off the tops of the boots to make them shorter and therefore avoid the calf issue. But I shall mull that one over a little longer before making a final decision as I am not sure I want short boots. Although these particular boots are no longer available, Barratts carry a wide selection of Wellies on their website all year round so you can always find something to suit. Many of their Wellies are on offer, too, so there are some real bargain available! Check out Barratts’ Wellies here. I never knew Barratts did wide-fit styles! The store in my area just shut down but ironically, if they had brought in a wide-fit range they might have made more sales (particularly from me). Those are lovely. To be honest, the cut you made looks like it's meant to be like that because of the black line there so don't worry too much. 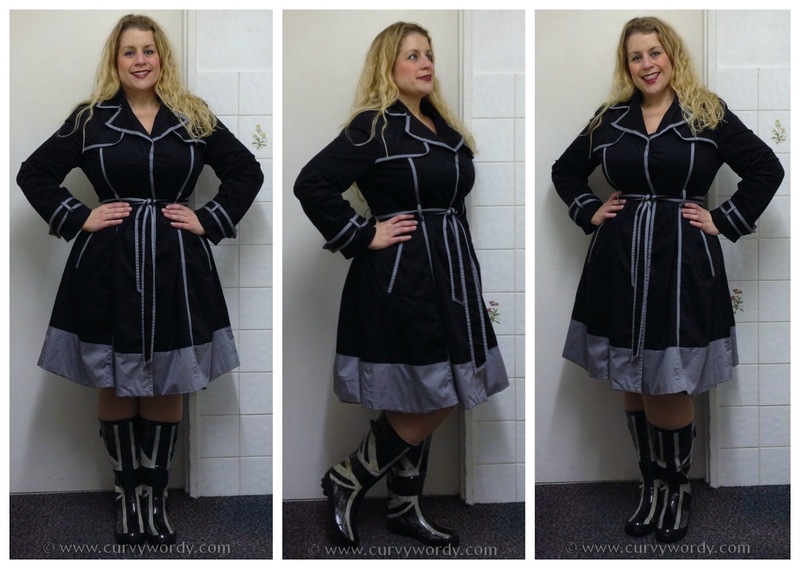 Love that coat too by the way xxLiked this post on Bloglovin <3http://thecurvygirlinthecorner.blogspot.comEnter My GIVE-AWAY! I think this whole outfit looks fantastic. Great coat, great boots. You could even do something like add laces or buttons and loops to the back of the boots if you wanted to jazz the slits up. I've seen where people have slit the backs of their boots, then added grommets and ribbon to make it look intentional. I'm thinking of trying it, myself, as I have about a 17-18" calf and NO boots fit me.